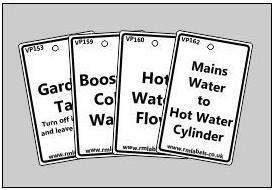 Plumbing Identification Tags for marking up isolation valves, stopcocks, cylinders, cisterns and pipework. 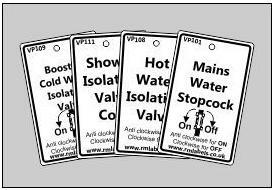 Plumbing Labels for all isolation valves, stopcocks, cylinders and cisterns. Plumbing Labels without pictograms for isolation valves and stopcocks and many other plumbing labels for cylinders, cisterns and pipe work, etc.